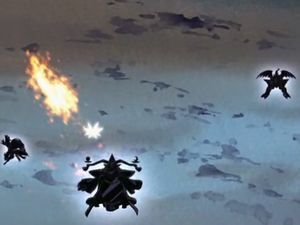 Possessing the attribute of "Steel", it is one of the legendary Ten Warriors Digimon that saved the ancient Digital World. An Ultimate who existed only in the distant past, it is the wisest person in the Digital World. Due to the Akashic Records which record all of the excellent intellects of ancient times, it is said that there is nothing which Ancient Wisemon doesn't know. It is a sage that possesses the knowledge of the distant past, but can also forecast the distant future. 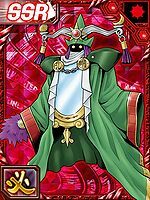 Also, it is said that Ancient Wisemon's mirror body is connected to another universe (a different world). 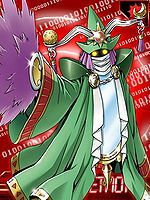 Ancient Wisemon's abilities were later passed on to the "Mutant Digimon". Its Special Moves are calculating the coordinates to the other world with ultimate wisdom and imprisoning the opponent for eternity in that separate universe (Laplace no Ma), and summoning the ultimate evil god from that universe (Elder Sign). Title: 「伝説の鋼の闘士」 — "Legendary Warrior of Steel"
adj., Of time long past. adj., Having the power of discerning and judging properly as to what is true or right. Wisemon is a pun on the word Wiseman 「ワイズマン Waizuman」. 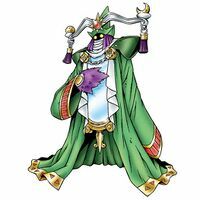 Ancient Wisemon has the appearance of a gigantic mirror shrouded in a green robe. This is a reference to Zhuge Liang as well as the kanji on its brooches which read "Kongming" (孔明), the courtesy name of Zhuge Liang. Its Special Move "Elder Sign" is a reference to the "Elder Sign", a magical symbol created by the Elder Gods as a form of protection against the Great Old Ones. Also, the description of the technique is a reference to the Elder Sign being a key "whereby the powers of the Elder Gods may be summoned when used with the proper words and shapes", mentioned in the Simon Necronomicon - The Testimony of the Mad Arab, which has strong associations with the Cthulhu Mythos, under the name "Agga". 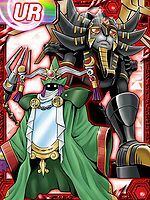 The Necromonion itself was believed and claimed by some occultists to have existed on the astral plane as part of the Akashic Records, to which Ancient Wisemon can access and decipher in order to acquire vast knowledge. 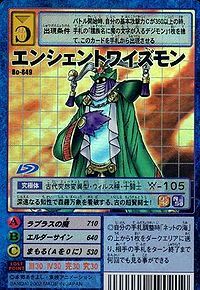 Laplace no Ma  Laplace's Demon ラプラスの魔 Rapurasu no Ma With ultimate wisdom, it calculates the coordinates to the spirit world and imprisons the opponent for eternity in a separate universe. エルダーサイン Erudā Sain Summons the ultimate evil god from that universe. 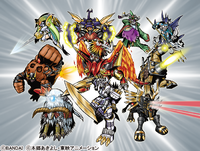 Ancient Wisemon (lower center) from Digimon Frontier fighting Lucemon. 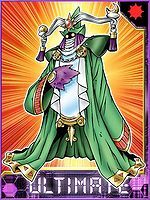 Ancient Wisemon was one of the Legendary Warrior Ten whose spirit was reborn in the Human Spirit of Steel to create Mercuremon and the Beast Spirit of Steel to create Sephirothmon. 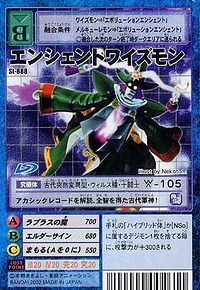 Ancient Wisemon can only be obtained as a collectible card. Its card is part of the Warrior Ten (十闘士 Juttoushi) set. Ancient Wisemon is available as a Digimon Medal. Having deciphered the Akashic Records, this ancient war god has acquired omniscience! This ancient, superintelligent warrior sees through all in nature with its profound knowledge! This page was last modified on 5 April 2019, at 06:27.